I’m sitting in my apartment in New York City going through emails when this contest from The New York Code + Design Academy* catches my eye. 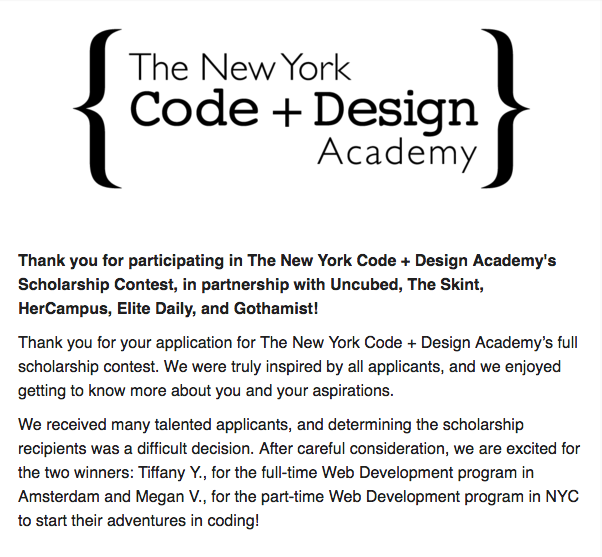 I haven’t heard of The New York Code + Design Academy but intrigued, I think, “hey, why not?” and enter the scholarship contest a day or two before the deadline. I enter a lot of contests. Most of the time, the odds are not in my favor. But every once in awhile, I’ll win something small like a jewelry dish, scarf, salad bowl, etc. A few days later, I get a call. “Wait, what did I win?” I’m in shock. When I get the call, I’m sitting in my office in midtown Manhattan where I’m a corporate development/finance director at a music startup. “What am I going to do about my job?” That’s the first thing that pops into my mind. I hesitate. “We’d love to announce this today or tomorrow, if possible,” she tells me. I’ve always wanted to explore Europe. More than ten years ago, I went to England for a month and the Canary Islands for a week. But as an adult, I’ve never been to Europe. The ten vacation days a year I’ve given from corporate world living usually mean brief weekend trips or quick flights to warmer climates like the Caribbean. I taught myself HTML when I was in high school to create a website for one of my hobbies. It wasn’t the most sophisticated site but I was so proud of the fact that I built it myself. My interest in coding was reignited in 2013 during a brief stint as a Venture for America fellow. Since then, I had been attempting to self-teach through free resources like Codecademy and General Assembly’s Dash. But every time, life, work, etc. would distract me and I would lose momentum. Last year, after launching Diversability and learning more about the disability space, I became more interested in innovation and universal design in the tech space. Technology should be accessible to and enhance the lives of everyone. I kept thinking, “When things slow down with Diversability, maybe I’ll take a look at part-time course.” Knowing me, adding a part-time coding course to my full-time job and side hustle wouldn’t be sustainable. And despite the plethora of coding bootcamps in New York, I knew it would be hard to pull myself away from my job for a full-time opportunity, even if I had received a scholarship. When I think of the universe, I’m reminded of Paulo Coelho in The Alchemist. It happened. The universe manifested itself and presented this opportunity to me. I had to take it. I said my goodbyes in NYC and arrived in Amsterdam in mid-April. Sometimes, self-doubt kicks in and I wonder if NYCDA made a mistake. Too late, I’m here. I am grateful to be here and excited to be on this journey. Tiffany Yu is a former Goldman Sachs investment banker turned web developer at NYCDA. She is the founder of Diversability. Follow her at @ImTiffanyYu. Wo! That sound great! How was it? Hi Sanah, it was amazing! Finished the program about 2 weeks ago. You should! I'd start with the free resources to see if you want to pursue it more seriously. Pretty amazing to build cool things too! I'll look into it! Thanks Tiffany! Suzie and 1 other upvoted this.